Is the San Francisco Dungeon Wheelchair Accessible? How many wheelchair users are permitted within the San Francisco Dungeon? Are there restrictions with Electronic Wheelchairs? Are mobility scooters, ECV's permitted within the San Francisco Dungeon? Where is the wheelchair entrance to The San Francisco Dungeon? Navigating around the Dungeon will be mainly via level pathways. However due to the nature of the attraction some floor surfaces are uneven. Access is also gained via low gradient slopes, a specialized wheel chair lift (restrictions apply) and a stair climber (restrictions apply) to the various levels of the attraction. The San Francisco Dungeon tour lasts approximately 60 minutes. For safety reasons we can only accept ONE (1) wheelchair user per tour group and only three (3) wheelchair users within the San Francisco Dungeon at any given time. For large groups of wheelchair users, please contact us for information on how we can assist you with booking your group. We would advise booking your visit in advance as wheelchair users without an advanced booking may need to wait a considerable time to start the tour or not be able to gain admission if we are fully booked. You can book in advance via our toll-free number. 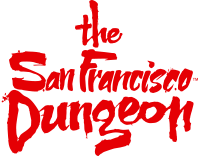 The San Francisco Dungeon is not suitable for those suffering from claustrophobia and anxiety. Is the San Francisco Dungeon ADA accessible?